In the conclusion of our three-part series on improving NDVI sensor data (see part 2), we discuss how to correct for limitations which occur in high leaf area index (LAI) conditions. Where there’s a large amount of vegetation, NDVI tends to saturate. NDVI is useful in the midrange of LAI’s as long as you don’t have strong soil effects, but as you approach an LAI above 4, you lose sensitivity. In figure 6, loss of sensitivity is primarily due to a saturation in the red band. Measurements were taken in a wheat canopy and a maize canopy. 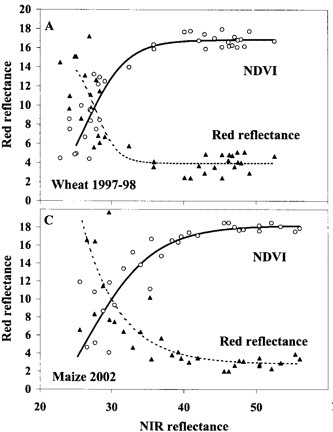 The near-infrared reflectance is sensitive across the entire spectrum of the wheat and maize canopies, but the red saturates relatively quickly. Where the red starts to saturate is where the NDVI starts to saturate. Note: NDVI saturates at high LAI’s, however, if your purpose is to get at the fractional interception of light, NDVI tends not to have the saturation issue. In Figure 7, Fpar or the fractional interception of light of photosynthetically radiation is nearly complete far before NDVI saturates. This is because canopies are efficient at intercepting light, and once we get to an LAI of about 4, most of the light has been intercepted or absorbed by the canopy. 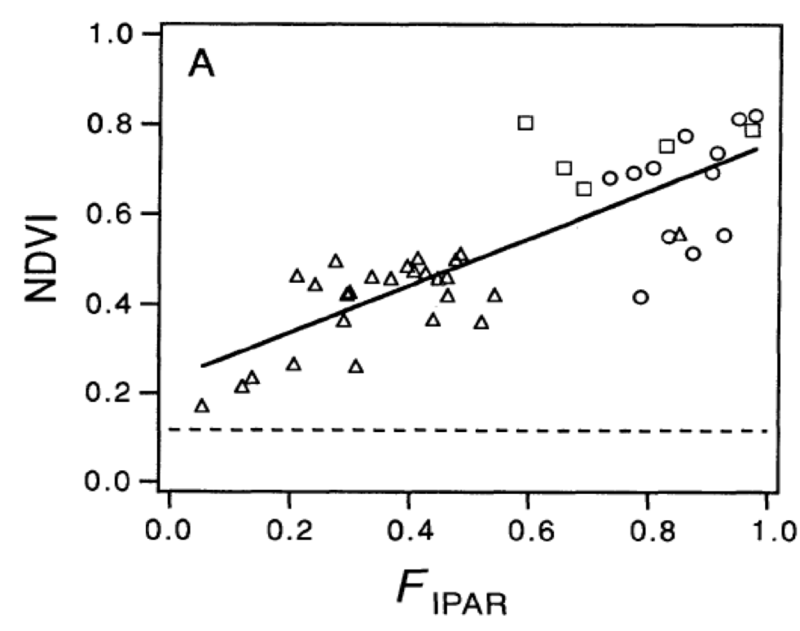 Thus, incremental increases in LAI don’t significantly affect the FPar variable. 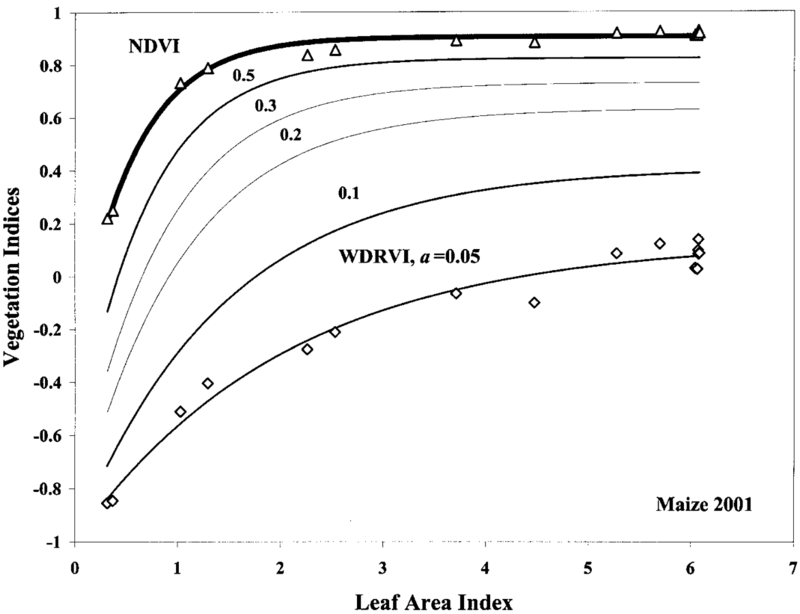 One solution for the NDVI saturation issue is called the Wide Dynamic Range Vegetation Index (WDRVI). Its formulation is similar to NDVI, except for a weighting coefficient that can be used to reduce the disparity between the contribution of the near infrared and red reflectance. In the WDRVI, a is multiplied by the near-infrared reflectance to reduce its value and bring it closer to the red reflectance value. In doing so, it balances out the red and the near-infrared contribution to the vegetation index. a can range anywhere from 0 to 1. Figure 8 shows that as we use a smaller value of a, we get an increasing linear response of the wide dynamic vegetation index to LAI. The only drawback of the WDRVI is that the selection of a is subjective. It’s something that you experiment on your own until you find a value for a that is optimal for your solution. People tend to err on the side of a very low value simply because they’ll get closer and closer to a linear response to LAI as a decreases. 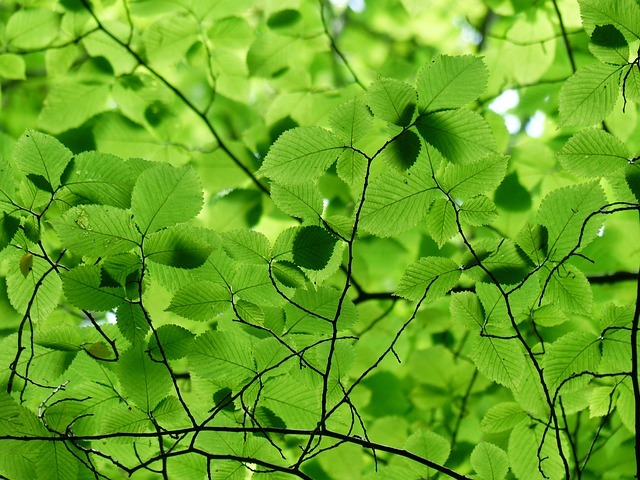 The enhanced vegetation index (EVI) was designed to enhance sensitivity in high biomass ecosystems, but it also attempts to reduce atmospheric influences. This was a vegetation index created for the purposes of a satellite-based platform. There’s a lot of atmosphere to look through from a satellite to the ground, and sometimes the aerosols in the atmosphere affect the reflectances in the red and the near infrared regions causing spurious observations. The EVI also tries to reduce sensitivity of the index to soil. Thus the EVI is a kind of solution to both extremes. In the EVI equation, the two major inputs are near infrared and red reflectances. C1 , C2, and L are all parameters that can be estimated, but the blue band is something that has to be measured. Most NDVI sensors are two band sensors, so you don’t have that information in the blue. Plus, with satellites, the blue band is relatively noisy and doesn’t always have the best quality data, thus EVI has limited value. Those problems led a scientist named Jiang to come up with a solution. 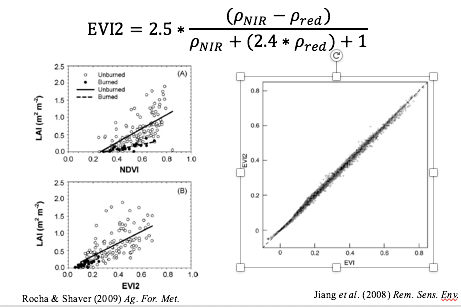 Jiang observed quite a bit of autocorrelation between the red band and the blue band, so he decided to try and formulate EVI without the blue band in what he called the EVI2 (Enhanced Vegetation Index 2). if you’re interested in the mathematics, we encourage you to read his paper, but here we give you the equation in case you’re interested in using it. When Jiang calculated his EVI2 and compared it to the traditional EVI (Figure 9), it was nearly a one to one relationship. For all intents and purposes EVI2 was equivalent to EVI. Since this avoids blue band, it offers some exciting possibilities as it reduces to just using the two inputs of NIR and red bands to calculate NDVI. NDVI measurements have considerable value, and though there are extremes where NDVI performs poorly, even in these cases there are several solutions. These solutions all use the near infrared and the red bands, so you can take an NDVI sensor, obtain the raw values of NIR and red reflectances and reformulate them in one of these indices (there are several other indices available that we haven’t covered). 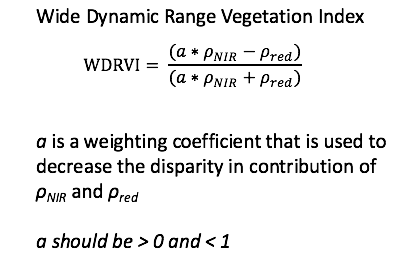 So if you’re in a system with extremely high or low LAI, try to determine how near infrared and red bands can be used in some type of vegetation index to allow you to research your specific application.